When thunderstorm phobia, state anxiety, and/or general anxiety are highly vexing, highly problematic, or particularly severe, a CPT behavior modification program may become further potentiated when implemented in conjunction with appropriately selected psychopharmaceutical medication. Although in less severe cases of canine phobia or anxiety, a properly designed and diligently implemented behavior modification program will result in successful goal outcomes without the inclusion of medication, circumstances occur where behavior modification alone is insufficient and the client pet’s progress plateaus far short of goal. Therefore, without an adjunct to the behavior modification program the phobic or anxious pet may continue destroying property, injure himself/herself, or suffer deleterious acute or chronic physiological effects. Adjuncts to behavior modification may include nutraceuticals, relaxation garments, pheromones, homeopathic remedies, and prescription medication. This article will function on prescription medications that may help to alleviate canine phobias and anxiety when administered in combination with a structured behavior modification program that teaches the dog cognitive coping mechanisms. Stimuli that commonly provoke acute or chronic anxiety in predisposed dogs include thunderstorms, separation, the addition of a new pet, status conflict with an existing pet, exposure to unfamiliar dogs, exposure to unfamiliar people, and the noise and commotion associated with construction projects. In such cases, when the dog’s reaction remains severe or chronic after the application of a behavior modification program and the dog can not be removed from the stimulus permanently or the provocative stimulus can not be permanently removed from the dog, prescription psychotropic medication may work synergistically with a CPT behavior modification program. When CPT recommends that a client visit a veterinarian for a medication consultation our objective is to better address severe or refractory cases, so that the client dog can move beyond plateaus and ultimately achieve a superior mental and physical quality of life. The information presented below was garnered from academic research, academic publications, and medical drug encyclopedias. Our research found that no single psychopharmaceutical strategy is universally preferred. Nevertheless, certain protocols are more frequently preferred based either on conclusions from veterinary research studies, generally accepted applications in human medicine, or historically accepted applications in veterinary medicine. Psychopharmaceutical inclusion in veterinary medicine is a fairly recent phenomenon. Moreover, research studies usually have small sample bases or are anecdotally generated. Thus, both the academic community and the practicing veterinary community have not reached a consensus regarding prescribed methodologies. Furthermore, since canine neurochemistry closely resembles human neurochemistry and humans may vary greatly from individual to individual in how they metabolize specific medications, trial and error may be required to match the proper chemical and dosage with the needs of an individual animal. Accordingly, we will list the most frequently recommended medication protocols for thunderstorm phobia first, then list less common alternatives for thunderstorm phobia along with recommended protocols for state and general anxiety. For thunderstorm phobia (astraphobia, brontophobia), the most widely accepted prescription protocol is amitriptyline (Elavil) on a daily maintenance basis in combination with either diazepam (Valium) or alprazolam (Xanax) prn on the day a thunderstorm is forecasted. Amitriptyline is a tricyclic antidepressant. Tricyclic antidepressants are used to counter depression, anxiety, sleep disorders, chronic pain, and enuresis (urinary incontinence). Amitriptyline potentiates the neurotransmitters serotonin and norepinephrine and inhibits the neurotransmitter acetylcholine. Side effects include lethargy, sedation, blurred vision, dry eyes, dry mouth, hypotension, constipation, and arrhythmias. The recommended dosage for canines is 1 -4 mg/kg of body weight every 12 hours. 1 kilogram equals 2.2046 pounds. 1 pound equals .454 kilograms. Thus, a 60-pound dog weighs approximately 27 kg and would receive 27 – 108 mg of Elavil twice per day. Since tablets come in 10 mg, 25 mg, and 50 mg varieties, the vet would probably prescribe 25 mg twice per day when beginning therapy. Onset is 2 – 3 weeks. Amitryptiline in combination with Xanax is the most widely recommended pharmaceutical therapy for treating canine thunderstorm phobia. Valium and Xanax are both from a class of drugs called benzodiazepines. Benzodiazepines are used as anxiolytics, sedatives, hypnotics (sleep aids), anticonvulsants, and muscle relaxants. Valium potentiates the inhibitory neurotransmitter gamma-aminobutyric acid (GABA) and produces skeletal muscle relaxation by inhibiting spinal polysynaptic afferent pathways. The recommended dosage for canines is .5 – 2 mg/kg of body weight as needed. Onset is 30 – 60 minutes. Side effects include dizziness, drowsiness, lethargy, physical dependence, and tolerance. Xanax potentiates GABA by binding to GABA-a receptor sites in a manner that suppresses hypothalamic-pituitary-adrenal axis responses. Xanax may also increase striatal dopamine levels. The recommended dosage is .03 – .1 mg/kg of body weight as needed with a maximum of 4 mg per application. Onset is 1 – 2 hours. Side effects include dizziness, drowsiness, lethargy, and physical dependence. Valium is an older drug than Xanax and has been used longer in veterinary medicine. Therefore, many vets will recommend Valium due to a lack of familiarity with Xanax. However, researchers have found that Xanax sedates less than Valium, while equivalently or more effectively reducing anxiety. In addition, Xanax lasts longer. In studies determining the effects of both drugs on dogs suffering from thunderstorm phobia, Valium lasted between 2 -4 hours, whereas Xanax lasted up to 10 hours. Consequently, since one cannot accurately predict the exact onset or duration of a thunderstorm while away from home for long periods of time, Xanax provides superior results. 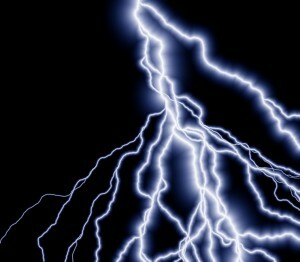 Moreover, some articles recommended Xanax as a stand-alone solution for both thunderstorm phobia and general anxiety. The second most widely recommended drug for thunderstorm phobia, buspirone (Buspar), is also widely recommended for general anxiety. Buspirone is classified as an anti-anxiety agent and serotonin agonist. Buspar reduces anxiety by binding to serotonin receptors and delivering an agonistic effect and by increasing limbic dopamine synthesis and release. Buspar may also increase norepinephrine metabolism. The recommended veterinary dosage for canines is 1 mg/kg of body weight one time per day. Onset is 1 – 3 weeks. Side effects include dizziness, drowsiness, fatigue, headache, insomnia, nervousness, blurred vision, nasal congestion, sore throat, tinnitus, tachycardia, nausea, rashes, myalgia, and incoordination. Despite the longer list of potential complications, Buspar has been successfully used for many years in veterinary medicine when treating cats for litter box issues arising from stress or anxiety. Several veterinary researchers prefer Buspar to benzodiazepines or a tricyclic-benzodiazepine combination therapy. Buspar is more mildly sedating and less physically addictive than Valium or Xanax. Diphenhydramine (Benadryl) is a nonprescription OTC antihistamine commonly used to combat allergic symptoms and complications. Diphenydramine also has secondary applications as an anxiolytic, to counter extrapyramidal tremors, to combat nausea, as an antiemetic, as an antitussive, and as a sleep aid. Benadryl bocks the action of histamines at peripheral H-1 receptors and is an anticholinergic/antimuscarinic. The drug also is an intracellular sodium channel blocker and a mild serotonin reuptake inhibitor. Side effects include dry mouth, drowsiness, tachycardia, urinary retention, and constipation. Ataxia may be a concern in high doses. The canine veterinary dosage is 1 – 4 mg/kg of body weight every 8 – 12 hours. Onset is 15 – 30 minutes. If administering diphenhydramine/Benadryl, be careful to provide only pure diphenhydramine to your pet, not Benadryl in combination with other medications, especially acetaminophen, which is highly toxic to dogs. Hydroxyzine pamoate (Vistaril, Atarax) is principally used as an antipruritic to combat the effects of allergies and allergy mediated atopic dermatitis. In addition, hydroxyzine has secondary applications as an anxiolytic, preoperative sedative, and antiemetic. Hydroxyzine depresses production of acetylcholine and histamines at the subcortical CNS level and blocks peripheral H-1 receptors. Side effects include drowsiness, dry mouth, urinary retention, constipation, and seizures. Hydroxyzine is not a popular choice for treating anxiety as it heavily sedates the animal, which then minimizes the value of associated cognitive behavior modification therapy. However, the drug may be indicated when managing acute anxiety or panic arising from a stimulus that is likely nonrecurring. Onset is 15 – 30 minutes. The canine veterinary dosage is 2 mg/kg of body weight every 6 to 8 hours. Clorazepate (Tranxene) is used in human medicine to treat anxiety, insomnia, manage alcohol withdrawal, and manage seizures. Tranxene is occasionally used in veterinary medicine to manage thunderstorm phobia and state anxiety, as an anticonvulsant, and to treat irritable bowel syndrome. Clorazepate stimulates GABA receptors, inhibits spinal polysynaptic afferent pathways, and enhances presynaptic inhibition. Side effects include dizziness, drowsiness, lethargy, incoordination, and physical dependence. Onset is from 1 – 2 hours. The canine veterinary dosages is .5 – 2 mg/kg of body weight as needed. When treating thunderstorm phobia, Tranxene is sometimes used prn in lieu of Valium or Xanax in combination with amitriptyline. It tends to last longer than Valium, but dissipates faster than Xanax. However, due to the potential for physical dependence and associated withdrawal symptoms, Tranxene is better indicated for intermittent short-term use when managing state anxiety provoked by a non-frequent stimulus. Please note that Tranxene may be contraindicated when treating fear aggressive animals, as there is a possibility of paradoxical effects that may exacerbate aggressive tendencies. Atenolol (Tenormin) is used in human medicine to manage hypertension and angina pectoris and to prevent myocardial infarction. In veterinary medicine, Tenormin is used for cardiac management and rarely to reduce the symptoms of severe phobias or panic. Tenormin blocks the stimulation of beta1 myocardial adrenergic receptors, which in turn decreases blood pressure and heart rate. Unlike Inderal, Tenormin does not usually affect beta2 (lung) receptor sites and has fewer central nervous system side effects. Side effects include fatigue, weakness, bradycardia, congestive heart failure, and pulmonary edema. Onset is from 0 – 60 minutes, depending on whether administration is intravenous or oral. The canine veterinary dosage is .25 – 1 mg/kg of body weight. Tenormin is not an appropriate long-term treatment for phobia or anxiety. However, the drug may have an application when treating the symptoms of acute severe panic, especially rapid heartbeat that arises from extreme sympathetic nervous system arousal. Propranolol (Inderal) is used in human medicine to manage hypertension, angina pectoris, and arrhythmias. Off-label uses include managing alcohol withdrawal, aggressive behavior, situational anxiety, and antipsychotic-associated akathisia. In veterinary medicine, Inderal is used to manage hypertension and arrhythmias and occasionally to reduce situational anxiety or panic. Inderal blocks stimulation of beta1 myocardial and beta2 (pulmonary, vascular, and uterine) adrenergic (epinephrine) receptor sites, which in turn decreases heart rate and blood pressure. Side effects include fatigue, weakness, bradycardia, and pulmonary edema. Onset is from 0 – 30 minutes, depending on whether administration is intravenous or oral. The canine veterinary dosage is .3 – 1 mg/kg of body weight. Inderal is not an appropriate long-term treatment for phobia or anxiety. However, the drug may have an application when treating the symptoms of acute severe panic, especially rapid heartbeat that arises from extreme sympathetic nervous system arousal. Due to its inhibition of beta2 receptors, Inderal is contraindicated in cases where a dog has a respiratory illness or condition or is suffering from congestive heart failure. 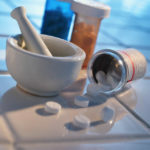 Although this article focuses on pharmaceutical solutions, I would be remiss if I failed to mention alternative or adjunct homeopathic solutions that may be safe and effective. Research shows that lavender can be helpful in alleviating anxiety. Aromatherapy may provide benefit in alleviating the symptoms of an anxious dog. The dog has a proportionately very large olfactory bulb and cortex. Moreover, the olfactory bulb connects directly to the limbic system, which is responsible for impulsive behavior and emotion. Consequently, aromatherapy potentially may have a significant effect in regulating impulsive out of context emotional states. 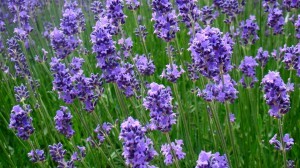 Lavender is an aroma that is reputed to promote sleep and relaxation in humans and animals. Several empirical studies have demonstrated the anxiolytic properties of lavender with humans. Lavender is available as an oil, spray, incense, or potpourri. There are also lavender treats and pure lavender that can be ingested orally. Side effects include skin irritation, photosensitivity, and gynecomastia in prepubescent boys. CPT clients have provided feedback that lavender is effective as an adjunct to behavior modification in about 20 to 25% of cases. Moreover, regardless of whether it works, clients like the smell. Therefore, given the efficacy, the low cost, and the relative safety, unless one has a young male child in the house lavender is likely a worthwhile inclusion to a dog’s anxiety reduction program. Dog Appeasing Pheromone (Comfort Zone, DAP, Adaptil) is a synthetic biochemical product that supposedly duplicates the primary pheromone secreted by a lactating female dog and that according to the manufacturer concomitantly reduces anxiety and the symptoms of anxiety in canines. The product is available as a collar, a spray or a wall plug-in. In theory and in research provided by the manufacturer, the pheromone unconsciously relaxes anxious puppies and dogs without physical contraindications or sedation. The manufacturer recommends dog appeasing pheromone in resolving general anxiety, thunderstorm phobia, separation anxiety, marking, chewing, barking, and obsessive-compulsive disorders. CPT anecdotal client feedback concludes that the collar is more likely to provide a tangible result than is the spray or plug-in. Yet, only a minority of clients noticed tangible improvement after implementing DAP. Nevertheless, there are no known side effects. Therefore, DAP is likely worth a try in combination with other therapies. Melatonin is a naturally occurring hormone secreted by the pineal gland that plays a role in facilitating normal circadian rhythms in humans and animals. Melatonin is also a homeopathic remedy that is classified by the FDA as a dietary supplement, not a drug. In humans and dogs, melatonin supplementation may relieve general anxiety and insomnia. The recommended canine dosage is .06 – .3 mg/kg of body weight three times per day. Onset occurs in as little as 10 to 15 minutes. In addition to melatonin supplementation, avoidance of artificial blue (ultraviolet) light may increase natural melatonin production. Side effects of melatonin supplementation are usually nonexistent. However, in high doses and long-term uses in humans melatonin has caused Parkinson’s like extrapyramidal symptoms and it can interfere with an intact female dog’s estrus cycle. Please note that melatonin may be contraindicated if a dog is also taking sedatives, corticosteroids, or MAO inhibitors. Nutraceuticals are nutritional products that have claimed pharmaceutical-type benefits. Composure is a product that the manufacturer, VetriScience, claims has calming properties. Several CPT clients have provided feedback that supports the manufacturer’s claims. Composure contains thiamine (vitamin B1), l-theanine, and c3 colostrum, which are constituents that academic research has proven provide anxiolytic benefits. The product is available in bite-sized chews. The manufacturer recommends a dose of between .5 to 3 chews daily, depending upon the size of the dog. There are no stated side effects. However, an excess of vitamin B1 may cause itchy skin or an upset stomach. Rescue Remedy (also called Five Flower Remedy) is an extreme dilution of a flower essence combined with brandy and water developed by Edward Bach, an English homeopath. Rescue Remedy consists of an equal amount of Rock Rose, Impatiens, Clematis, Star of Bethlehem, and Cherry Plum essence in combination with brandy and water, although veterinary versions are usually sold alcohol free. The product is available in a liquid or spray. The canine dosage is either 4 drops or 2 sprays applied to the tongue. Empirical research has several times shown that there is no benefit beyond that of a placebo. Nevertheless, many users anecdotally state that they observe benefits. Thundershirt is a vest that the manufacturer, Thunderworks, claims relieves canine thunderstorm phobia, state anxiety, and general anxiety. The manufacturer claims that the acupressure and “gentle hugging” that arises from the product’s design and elastic materials releases endorphins and calms animals that wear the garment. The manufacturer states that a survey of 2,000 Thundershirt customers found that 82% of the customers observed “improvement” in their dog. Anecdotal feedback from the CPT client-base returns a much lower figure, with only 20% to 25% of clients observing tangible improvement. Moreover, some clients found a worsening of symptoms, as their dog disliked the tight fit of the Thundershirt material and the clients felt that the material made their dog “uncomfortably hot.” Nevertheless, the product is inexpensive (approximately $40) and has no serious side effects. Therefore, Thundershirt is likely worth a try in combination with other therapies. The veterinary version of fluoxetine, Reconcile, comes in flavored chewable tablets. Fluoxetine (Prozac, Reconcile) has received FDA approval for use on dogs when treating separation anxiety. Veterinarians commonly prescribe fluoxetine when treating general anxiety, various forms of state anxiety, and obsessive-compulsive disorders. Moreover, Prozac is the researcher’s drug of choice when treating reactive behavior, especially dominance aggression, fear aggression, or possessive aggression directed toward humans or dogs. 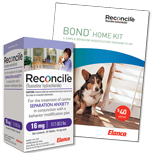 For dogs that are reluctant to take pills, fluoxetine comes in a flavored chewable tablet called Reconcile, which can be highly beneficial for owners hesitant to administer pills to a highly frightened or potentially aggressive pet. Fluoxetine selectively inhibits the reuptake of serotonin in the central nervous system. Serotonin (5-HT) is found in the gastrointestinal tract and platelets, is a primary CNS neurotransmitter responsible for regulating mood, appetite, and sleep, and is involved in the processes of learning and memory. Thus, by inhibiting reuptake and increasing the amount of synaptic serotonin available to 5-HT receptors, fluoxetine often elevates the mood and increases stress thresholds relevant to phobic or anxious animals. In addition, fluoxetine may help with the cognitive processing of information presented within a structured behavior modification program. The canine veterinary dosage is from 1 – 2 mg/kg of body weight every 24 hours. Onset is from 1 – 4 weeks. Side effects include anorexia, anxiety, drowsiness, headache, insomnia, diarrhea, itching, tremors, and seizures. Fluoxetine may be contraindicated in animals that have a compromised liver. Paroxetine (Paxil) has not been researched in canines as extensively as its related drug, Prozac. Eli Lilly invested time and money to complete the rigorous testing required to obtain FDA approval for Prozac’s use with dogs for the purpose of resolving separation anxiety. GlaxoSmithKline has not completed the same tests for Paxil. Nevertheless, veterinarians are allowed to prescribe Paxil as an off-label drug. In human medicine, Paxil is used to treat depression, panic disorders, and obsessive-compulsive disorders. Paxil inhibits neuronal reuptake of serotonin in the CNS, which potentiates serotonin activity. Unlike tricyclic antidepressants, there is little or no effect on norepinephrine or dopamine. The canine veterinary dosage is from 1 – 2 mg/kg of body weight every 24 hours. Onset is from 1 – 4 weeks. Side effects include anorexia, lethargy, increased thirst, anxiety, dizziness, drowsiness, headache, insomnia, weakness, constipation, diarrhea, dry mouth, itchy skin, nausea, and tremors. In addition, sudden stoppage may cause withdrawal symptoms. Sertraline (Zoloft) is chemically similar to both Prozac and Paxil. However, veterinary behavioral researchers have not studied the effects of Zoloft as extensively as they have Prozac and Pfizer has not attempted FDA approval for veterinary purposes. Yet, veterinarians may prescribe sertraline as an off-label drug. In human medicine, Zoloft is used to manage depression, panic disorders, and obsessive-compulsive disorders. Zoloft inhibits neuronal reuptake of serotonin in the CNS, which potentiates serotonin activity. Zoloft is also is a minor dopamine reuptake inhibitor. The canine veterinary dosage is from 2.5 – 5 mg/kg of body weight every 24 hours. Onset is from 2 – 4 weeks. Side effects include anorexia, dizziness, drowsiness, fatigue, headache, insomnia, diarrhea, dry mouth, nausea, and tremors. Clomicalm was the first drug to receive FDA approval for treating canine separation anxiety. Clomipramine (Clomicalm), manufactured by Novartis, was the first psychopharmaceutical medication to receive FDA approval for reducing separation anxiety in canines. Off-label veterinary use has included applications for treating depression, general anxiety, obsessive-compulsive behavior, tail chasing, and lick granulomas. Clomipramine has been used in human medicine to alleviate obsessive-compulsive disorder, panic disorder, depression, and enuresis. Clomicalm inhibits serotonin reuptake and to a lesser degree norepinephrine reuptake. The drug is also a histamine and acetylcholine antagonist. The recommended veterinary dosage is 1 – 2 mg/kg of body weight every 12 hours. Onset is 1 – 6 weeks. Side effects include lethargy, sedation, weakness, blurred vision, dry eyes, dry mouth, constipation, nausea, vomiting, seizures, and arrhythmias. Clomicalm may be contraindicated in dogs that have a history of seizures or in male breeding dogs. Doxepin (Sinequan) is used orally in human medicine to manage depression and anxiety and topically to relieve pruritus (itching) stemming from eczema and other forms of dermatitis. In veterinary medicine, researchers have found doxepin beneficial in managing general anxiety, thunderstorm phobia, and obsessive-compulsive disorders. Due to its histamine blocking and anxiolytic qualities, Doxepin can be very effective in treating allergy-mediated pruritus, licking, and chewing. Doxepin prevents the reuptake of serotonin and norepinephrine by presynaptic neurons and reduces the effects of acetylcholine and histamines. The recommended canine veterinary dosage is .5 – 1 mg/kg of body weight every 12 hours. Onset occurs in 2 – 3 weeks. Side effects include blood pressure changes, tachycardia, fatigue, sedation, blurred vision, hypotension, constipation, and dry mouth. Doxepin is contraindicated in pets with glaucoma, pets predisposed to urinary retention, or pets with a history of seizures. In addition, there may be drug contraindications with sedatives, antihistamines, norepinephrine, thyroid medications, atropine, and phenytoin. Doxepin may increase the potency of drugs designed to increase blood pressure and H2 histamine antagonist medications that decrease stomach acid. Imipramine (Tofranil) is used in human medicine to treat depression, juvenile incontinence, adult incontinence, vascular headaches, cluster headaches, and chronic pain. In canine medicine, imipramine is occasionally used to alleviate anxiety, awake urinary incontinence (especially in female dogs), and nocturnal enuresis. Imipramine is a strong serotonin and norepinephrine reuptake inhibitor and to a lesser degree a dopamine agonist. Imipramine also is an acetylcholine and histamine antagonist. The veterinary dosage is .5 – 1 mg/kg of body weight once to twice per day. Onset occurs in several hours. Side effects include drowsiness, fatigue, blurred vision, dry eyes, tachycardia, hypotension, constipation, and dry mouth.. Imipramine may be contraindicated if a dog is also taking sedatives, tranquilizers, or drugs to reduce stomach acid. The above article is for informational purposes only and is not intended to replace the services of a veterinarian. CPT wholeheartedly recommends that readers consult a licensed veterinarian before commencing any medicinal treatment with their dog, regardless of whether the medication is available only by prescription, is available over the counter, or is considered homeopathic. © Copyright Mark Spivak and Comprehensive Pet Therapy, Inc., February 2007, Revised March 2014. All rights reserved.